MOSUL, Iraq (Mar. 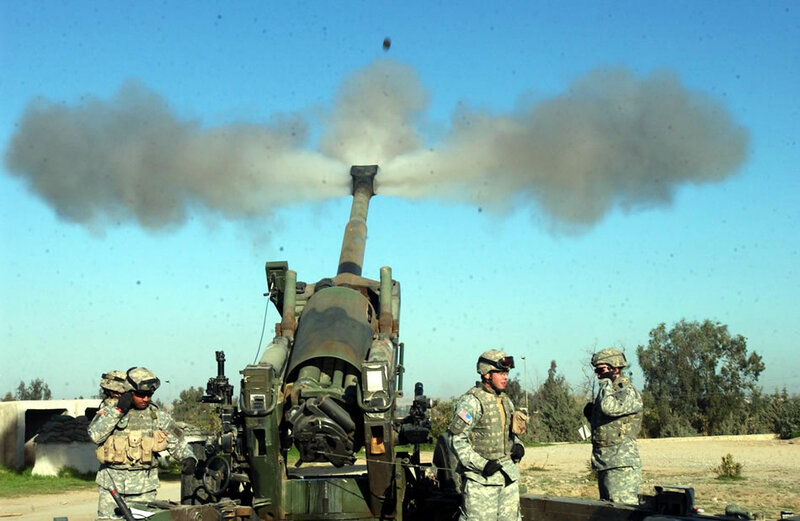 6 2006) � Battery C, 4th Battalion, 11th Field Artillery performed a series of artillery calibration fires from Forward Operating Base Courage, Mosul, Iraq Mar. 6. The 11th FA conducted this mission to ensure accurate l fires for brigade operations. The M198 Howitzer Medium Towed Howitzer is a 155mm field artillery howitzer. It is constructed of aluminum and steel and has a maximum rate of fire of four rounds per minute. According to unclassified military website, the M198 provides the user with a towed system that is air transportable, has a high reliability and availability while greatly increasing the effective range of towed weaponry. It provides significant improvements in lethality, range, reliability, and rapid emplacement and movement. Wrightman also said that the gun is very accurate. They practice to make sure they hit the target and not have any mishaps when called on to fire at the enemy.